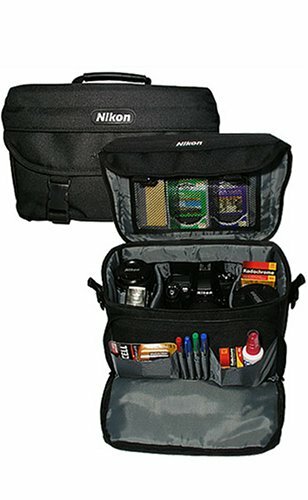 Protect your valuable camera investment with this Nikon brand camera carrying case. Made from durable Cordura Nylon, and outfitted with a reinforced handle, this compartment case will easily hold your camera, lenses, flash, and accessories. Travel is made even easier and safer with the slip-resistant shoulder strap. The many zippered pockets hold all your supplies. A small pocket on the outside of the top flap allows easy access to film, memory cards or batteries. Large sewn pockets inside the front flap safely protect filters, pens, cleaning supplies, and lens caps. A mesh pocket inside the top flap provides for easy access to additional storage. The best feature however is its large padded storage and compartment space. Removable velcro dividers provide individual customization to your equipment. Whether you use this case for your Digital or your 35mm SLR, the Nikon Compartment Case will hold all of your most essential accessories. I got this camera bag as part of a nikon kit with an N75 camera a couple years ago. As a beginner-amateur, this bag served my purposes quite well till recently -- i carry my nikon n75 with its lens attached in the main compartment, a 70-300mm G lens positioned face down in one of the velcro divisions, my Coolpix 4100 in another of those divisions, plus either a few filters or the charger for my Coolpix's batteries in another division. The netting under the cover carries 8-9 rolls of film for me. The front zipper is useful to carry spare batteries, lens cleaning cloth, etc. Quite spacious, in other words, as long as you only have 2-3 lenses, and none of them are very long. i recently broke my 70-300mm zoom, and i partly blame the bag. You see, unless you're seeing the bag from the front, you can't easily make out whether the bag is locked or not. And this time, I just happened to pick up the bag quickly, without realising it wasn't locked, with the result that the camera in it fell face down on the stone steps below, thus killing my zoom lens. The bag needs to be designed better to prevent this.. the center of gravity should be located so as to prevent the bag from tipping over easily and/or maybe straps or something should be provided on the inside to hold the camera and lenses more snugly and prevent them falling out. Excelente material y confeccion. El tama?o adecuado para mi Nikon D90, lentes y otros articulos. I received the gadget bag as a birthday present. I use the bag to carry my D80 with an 18-200 VR lens, a Sigma 10-20 lens, spare battery, camera remote, spare 2GB SD card and cleaning accessories. They all fit into the bag but it is a tight fit. I wish it were a little larger. its bigger than it looks in pictures and therefore better. You'll never know until you see it! 1.Size-(12x8x8)bulky but spacious for beginner's kit. This is a "Small" Camera Bag. I don't know what some of these reviewers are talking about when they say that this camera bag has "plenty of space". It would "most assuredly" be classified as a "small camera bag". If you've only got 1 camera, one extra lens, an external flash and the normal amount of "support" items for this gear, then it will work, but still small. But it is priced right for its size. My biggest complaint is that there is no "quick" zipper under the flap to quickly secure the lid. Instead you have to buckle "4" buckles down to secure the lid. And the shoulder strap has "NO" padding. I removed it and put another one on that had padding. I was lucky that I had an extra "black" strap with padding laying around. Okay, first off, the bag is less than thirty bucks so you can't expect much. It was included in an online purchase that I made. (I wouldn't buy it as a stand-alone product.) Don't even think about flying with this bag, especially if your hardware is on the heavy side. And walking around for any length of time exceeding ten minutes, or any distance exceeding that between your car and your home or office, is asking for trouble. I usually carry a D200 with two nikkor VR lenses and two Nikkor prime lenses. This is a pretty heavy load, and the bag shows it. The shoulder strap is just rediculous and the snaps are cheap. The nylon strap fastens to plastic D-rings that are ill-fitted, causing the nylon material to bunch up at the narrower ends. I also wonder about the strength of the D-rings, the snaps, etc. One sudden move, or jolt, and those babies could break, spilling your expensive gear onto the concrete, or into the sand, or worse, into a river or lake. The top cover does not fit snugly, even with side snaps secure, allowing dust to get in through the sides -- if you are traveling in a city like Cairo, that's a BIG problem. It also allows people to see into (or perhaps even reach into) the bag. The strap also does not come with a shoulder pad. While I consider comfort a minor priority, it's a pretty big deal to a lot of people. Should've been free with the BIG$$ Camera & lens purchase! This bag is plenty big for me; I have a D-200 with an 18-200 lens attached most of the time and it fits vertically into the bag just fine. There is also room for another couple of lenses, flash, batteries and other accessories. I wouldn't want to carry around any more. The only problem I have with this bag is the shoulder strap that I wish was wider, or had a padded piece over the shoulder. If you fill this bag, it can get to be a pretty heavy load. Awesome Product - Awesome Price! I originally bought this bag about 10 years ago as part of a $50 promo deal (including some other items) at a local camera shop. Its size and features appealed to me and it's since been through heck and back, still in good shape and in use by my wife for location shoots (she's a family and child photographer). I bought this bag for my Nikon D80 from Cameta Camera, i read the reviews and decided to bought it despite some bad coments. The bag is slightly different from the one in the picture, its more square. Like some other costumers have said, it comes with 4 buckles and personally i would prefer if it came with a zipper instead and maybe only 2 of the four buckles. Its a good bag for the price, it looks genuine (i read somewhere that the Nikon tag seemed fake, not mine) it has plenty of room. Im still not sure if its good enough to carry everywhere with me.. Being new to the photography world, I wanted a bag that would hold all my new equipment. This nylon bag is perfect for meeting my needs. It has well protected, adjustable inner compartments, which support my Nikon D80 camera; my 18x135 lens; tons of small gadgets with room to spare. A zippered pocket under the inside top and a smaller pocket on the outside help keep little things within reach. It has a very comfortable shoulder strap. If you choose to wear it using the shoulder strap and push the bag towards your back...be careful when in crowds of people or around small conjested areas... I admit, I was like a bull in a china shop until I got used to carrying it. I searched camera shops and this is by far the best bag for workmanship, durability and value!